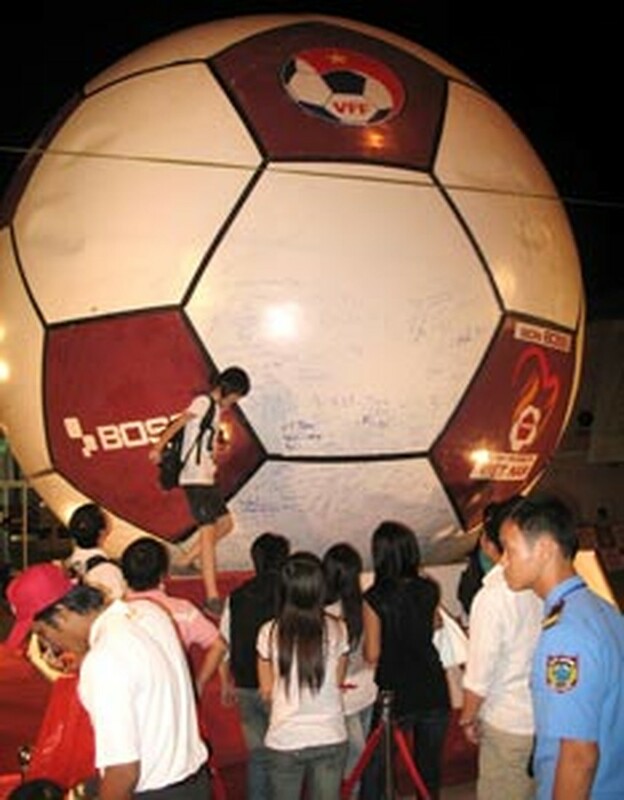 Many of Ho Chi Minh City football fans flocked to the Youth Culture House Wednesday to stir up a football atmosphere there, where was staying a huge ball with thousands of signatures on it already. City fans also joined a ceremony launching a website designed to further promote a nationwide campaign initiated in July to collect one million signatures to support Vietnam’s Olympic team in December’s 25th Southeast Asian Games in Laos. The campaign organizers – paint company 4 Oranges and media company Country Eye Creative – also kicked off two contests, one for photos of Vietnam’s football and the other for writing about the country’s national squad and U-23 team. The website at www.traitimbongda.com or www.traitimbongda.vn is for gathering online signatures and the two contests. 4 Oranges is a sponsor of Vietnam’s national squad and the U-23 team. 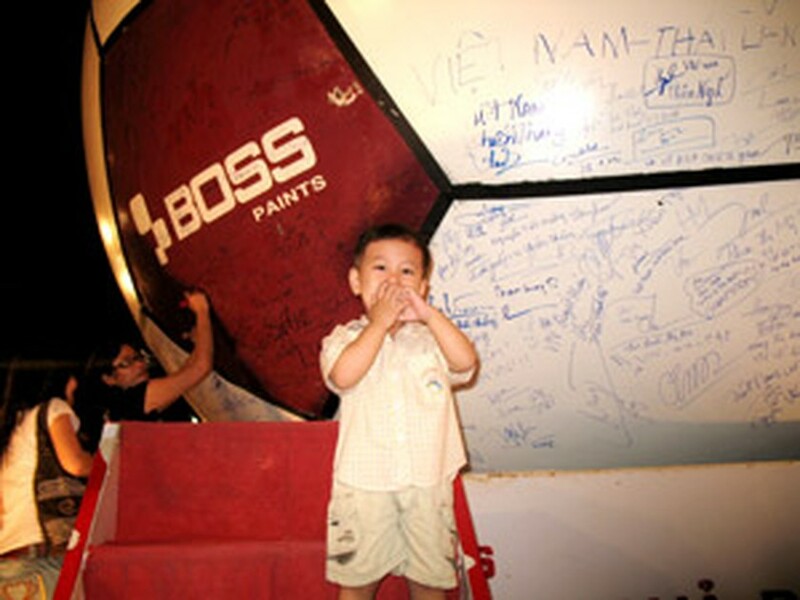 Boss Paints is the company’s brand associated with the support campaign. Company marketing director Chalermsak Pimolsri said about 400,000 signatures have been collected since the campaign was launched in July. He added that given the availability of the website, many more signatures would be taken into account. This December, U-23 Vietnam will compete against other regional U-23 teams in the SEA Games in Laos. As from 2001, the SEA Games events are limited to U-23 teams instead of national teams as before. With support from the Vietnam Football Federation, 4 Oranges and Country Eye Creative will bring the campaign’s huge ball of 6 meters in diameter and 1.2 tons in weight to Vientiane, and put the composite ball in stadiums where the Vietnamese team will play. The two companies are arranging a trip to Laos for over 200 fans to accompany the ball. The ball started its nationwide tour in the Mekong province of An Giang in July, going through Gia Lai, Danang and Dong Nai, and is present in HCMC now. During the support campaign, boards have been set up at stadiums to collect signatures from fans. The public now can go online to sign. The ball will stay in Hanoi during the Vietnam Football Federation Cup on November 5-9, where the U-23 teams of China, Singapore, Thailand and Vietnam will compete. The tournament is a test for Singapore, Thailand and Vietnam before their SEA Games campaigns. Mr. Chalermsak Pimolsri said VND500 million (about US$29,000) is his company 4 Oranges’ award for Vietnam if they gain the SEA Games gold medal.